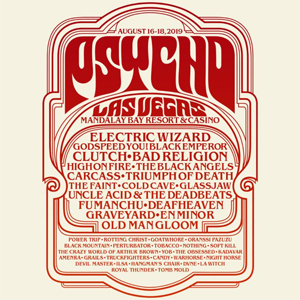 PSYCHO LAS VEGAS, America's annual rock 'n' roll bacchanal, will take over Mandalay Bay Resort And Casino August 16th through August 18th. Notorious for its consistently stacked lineups, the curators of the event have announced artist additions over the last few weeks, the latest of which includes American rock institution CLUTCH, doom metal icons ELECTRIC WIZARD, punk rock legends BAD RELIGION, post-metal sensations DEAFHEAVEN, extreme metal progenitors CARCASS, avant sludge metal luminaries OLD MAN GLOOM, experimental veterans, GODSPEED YOU! BLACK EMPEROR, the worldwide debut of Philip H. Anselmo's EN MINOR, Tom Gabriel Warrior's tribute to HELLHAMMER, TRIUMPH OF DEATH, blackened death/thrash heroes GOATWHORE, and others. The final lineup has yet to be revealed and fans can expect additional band announcements over the next few months. See confirmed bands thus far below. PSYCHO LAS VEGAS remains unmatched in its level of presentation and 2019 promises not only a bigger and better festival but the experience of a lifetime. The event will feature four stages, including the newly renovated Mandalay Bay Events Center, the iconic House of Blues, Mandalay Bay Beach, featuring a wave pool and lazy river, and Rhythm & Riffs - a Vegas-style lounge in the middle of the casino floor. Attendees will have access to discounted room rates at both Mandalay Bay and various MGM Resorts hotels, at THIS LOCATION. Though the highly coveted "Psycho Special" passes sold out instantly, "Tier 1 Weekender General Admission" passes are still available at $249 but will increase to $299 once the first tier sells out. PSYCHO LAS VEGAS is the premier vacation-destination music festival in the US for those who worship all that is rock 'n' roll. After three award-winning years housed under the confines of the Hard Rock, the event is moving to the Mandalay Bay Resort & Casino through an exclusive partnership with MGM Entertainment, and will usher in a new era of spectacle, performance, and production. Meticulously curated, the annual gala has become notorious for delivering diverse and eclectic lineups -- from rock and metal to world music and electronic -- the likes of which have never been seen in North America. In 2019, PSYCHO LAS VEGAS is rebooting America's conception of what a festival can be, on its own terms and with its signature mix of grit and grandeur.